Col. M. Lewis Clark Jr., inspired by the Epsom Derby (Eng-G1) in England, inaugurated the Kentucky Derby in 1875 at his newly opened Louisville Jockey Club Course. The race was designed to be the center of Thoroughbred racing in Kentucky. The race was also meant to be the major social event of the year in Louisville.The first Kentucky Derby was held May 17, 1875. A field of 15 three-year-olds went postward for the 1 1/2 mile contest which was won by H.P. 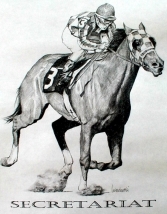 McGrath's Aristides, trained by Ansel Williamson and ridden by the popular African-American rider, Oliver Lewis. There was an estimated 10,000 people on the Jockey Club grounds. The fastest Derby was achieved by the legendary Secretariat, who covered the 1 1/4 miles in 1:59 2/5. Secretariat is the only Derby winner to finish under two minutes. Pimlico Race course first opened in 1870 and directed by Maryland Governor Oden Bowie. He built the Pimlico Race course to honor the first great horse to race there, Preakness. Governor Bowie proposed a stakes race for three-year-olds at 1-1/2 miles. The Preakness Stakes, the second jewel of American racing's Triple Crown, was then inaugurated in 1873, two years before Col. M. Lewis Clark's vision would bring the Kentucky Derby into the world. The Preakness was moved to New York in 1890 when financial problems hit the Maryland Jockey Club. 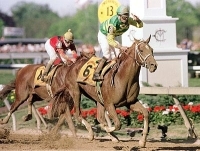 The Preakness continued to be run in New York almost two decades, with Gravesend race track in Brooklyn hosting the race 15 times. In 1909, with the Maryland Jockey Club emerging from its financial difficulties, the Preakness came back home and has never left. The race was established at its current length of 1-3/16 miles in 1925. In 1930, Gallant Fox's Triple Crown-winning effort required him winning the Preakness on May 9 and the Kentucky Derby eight days later. In the mid-1930s, the race was moved to mid-May, putting it one week after the Kentucky Derby. The current spacing of two weeks between races was established by the late 1940s. The oldest of America's three Triple Crown races, the Belmont Stakes was first run on June 19, 1867, at the Jerome Park race course. This track was an oddly shaped, English-style track that required its runners to negotiate three turns instead of two because of a dip in the middle of the backstretch. A filly, Ruthless, won the first Belmont's $1,850 winners purse. The Belmont has established itself as the ultimate test of championship stamina in this country. Its 1-1/2-mile distance now has become a rarity in American dirt races. 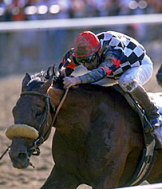 Because of its distance and status as the race that can make or break a Triple Crown champion, the Belmont Stakes has been the venue for some of the most famous moments in American racing. There was Count Fleet and his 25 lengths victory over two other competitors in the 1943 renewal; Secretariat winning by 31 lengths in record time; and there was Affirmed and Alydar, dueling away at each other for nearly a mile before Affirmed became a Triple Crown winner in 1978.